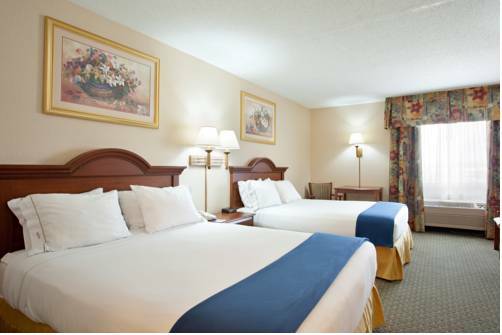 Lincoln, Illinois Hotel - Your Home Away from HomeWelcome to the Holiday Inn Express Hotel Lincoln. Our location off I-55 at exit 126 offers travelers a comfortable, affordable home-base for exploring Lincoln, Illinois. This hotel is conveniently situated north of Springfield and also near Bloomington.Those seeking Lincoln hotels with event space need look no further. With 1200 sqft of meeting space, we can seat up to 50. We're happy to setup to your specifications. Business guests also appreciate the hotel's proximity to Lincoln, Illinois companies, including Saint-Gobain, Eaton Corporation, International Paper, LCU, Lincoln College and Abraham Lincoln Memorial Hospital.Leisure travelers can also find tons to do near the hotel's address in Lincoln, Illinois, from exploring Kickapoo Creek Park to browsing downtown's shops and historic sites. The annual Lincoln Art & Balloon Festival promises family fun, too, with a craft fair, fine art fair, wine tastings, kid activities and so much more.As the smart choice for area travelers, this hotel offers the amenities guests prefer. Each morning, you can go for a swim in the indoor pool or workout in the Fitness Center before enjoying the free, hot breakfast. Business services like free Wi-Fi access help guests stay connected. We even welcome pets! Steak & Shake: Steak n Shake was founded in 1934 just up the road in Normal, Illinois. They are known for their classic steak burgers and milkshakes. Blue Dog Inn: The Blue Dog Inn has been serving up good food in Lincoln, Illinois since 1979. Aside from their highly acclaimed burgers, Blue Dog Inn also serves up horse shoes, unique sandwiches, specialty drinks, desserts, and more! By the Bean: Specialty coffee shop and bakery. Rio Grande Restaurant & Bar: Rio Grande Mexican Bar and Grill offers delicious Mexican food in a fun atmosphere with something for everyone. With Monster Margaritas and Taco Tuesdays, what more could you want? Fast Food: Several fast food options are nearby, including Arby's, Taco Bell, McDonalds, Hardees, and more. The Holiday Room: Our Holiday Room is a great place for your next board meeting, training session, or luncheon! The room offers a wetbar space with refrigerator/microwave, 40" flat-panel television with DVD/laptop connections, pull-down projector screen, and whiteboard. Historic Mt. Pulaski SquareThe historic Mt. Pulaski sqaure is home to many unique shops and restaurants. Spend the afternoon trolling through their antigue stores, specidlay shops, and hisotric buildings. Mt. Pulaski is located approxmatly 10 miles from our property in Lincoln. State FairgroundsThis can be found on the Illinois State Fair website as it changes for events.